Explore interactions between people and chimpanzees and other primates in the rainforest of Uganda to improve human–primate relationships. As food supplies decline, chimps in the Budongo Forest are raiding farmers’ crops. What is causing the decline in food? 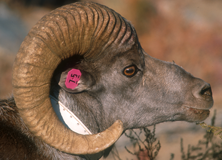 How can the area support both farmers and primate foragers? In the Budongo Forest Reserve in Uganda, fruit production by forest trees is mysteriously declining. As a result, chimps and other primates are raiding local subsistence farms. Dr. Fred Babweteera of the Royal Zoological Society of Scotland, along with graduate students from Makerere University, Kampala, is studying the foraging habits of primates and the pollination and fruiting cycles of fruit trees with the goal of developing new approaches to sharing resources between people and primates—and they need your help. On this expedition you’ll have a unique opportunity to meet our closest relatives in their natural habitat. About 700 chimpanzees live in the Budongo Forest Reserve, the largest remaining tropical rainforest in East Africa. 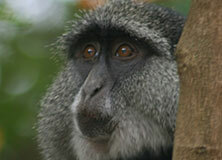 In addition, there are four other major primate species in the Budongo Forest. You’ll team up with field assistants at the Budongo Conservation Field Station to observe chimps and other primates as they forage for food in the morning and late afternoon. You’ll learn to identify local trees and work alongside researchers to monitor trees, set and empty insect traps, and label and preserve the collected insects for later identification. You’ll help write up the data and relax at the research camp, enjoy sports with members of the Reserve staff, or walk the “Royal Mile” to take in the natural beauty of the rainforest. With fewer fruiting trees in the forest, primates are raiding subsistence farms, which puts them in danger. Help Earthwatch scientists gather data to better understand why chimps are suffering from food shortages in the Budongo Forest of Uganda. The Budongo Forest is home to many fruiting trees and several species of primate that depend upon tree fruit as a major component of their diets. Local community members live along the forest edge and maintain subsistence farms on less than two acres (0.8 hectare) of land. One of the major threats to farmers’ livelihoods is crop raiding by forest primates. Since 1993, researchers in the Budongo Forest Reserve have observed a 15% decline in the number of fruiting trees in the forest; the reasons for this decline are unknown. The result of fewer fruiting trees is an increase in raids by forest primates on subsistence farms—and increased human–wildlife conflict. Collect tree phenology data from plots in the forest. This research team is investigating whether changes in climate and/or insect pollinators are responsible for changes in the number of fruit trees or seasonal fruit production. In addition, the team is investigating the implications of changes in tree fruiting in the area for human–wildlife conflict and food security. The project has established plots in which selected trees are monitored monthly to record fruiting patterns. At the same time, the project is collecting data on weather, visits by pollinating insects, and foraging on fruits by primates. Data are also collected to correlate the patterns of crop raiding with the pollination and fruiting patterns of forest trees. The primary outcome of this research will be the development of a plan to reduce conflict between local community farmers and raiding wildlife. The Budongo Conservation Field Station is located in the Budongo Forest. The land is flat and the climate is tropical and calm, with an average temperature of 79 degrees Fahrenheit (26 Celsius). People in the field station and neighboring Masindi town are welcoming and accustomed to interactions with foreign visitors. At the nearby Kinyara Sugar Works, visitors are welcome to use the swimming pool and relax at the pool bar on their recreational day. Budongo Forest is ranked among the top five tourist destinations in Uganda. It is a hot spot for species diversity. The forest contains the Royal Mile, named for its popularity as a traditional stopover for Uganda's royalty. The Royal Mile is a superb birding spot, with many West and Central African species in addition to the local East African species. The forest is home to the largest chimpanzee population in Uganda. Day 2: Safety briefing and training day. Begin transect work in the afternoon. Day 12: Return to Entebbe, depart on flights leaving after 5:00 p.m. Follow foraging primates. Track primates (chimpanzees, blue monkeys, red-tailed monkeys, and/or colobus monkeys) as they look for food. You'll record where they go and what fruits they eat. Hike to record vegetation. Help the scientists understand why many tree species are no longer bearing fruit by recording which trees have fruit and monitoring the rainfall and temperature throughout the forest. Record pollinators. While you're hiking, you'll also count pollinators like bees and butterflies found in specific areas and collect specimens that you'll log back at the research station. Survey community members. Interview people who live near the reserve to find out when and how often primates raid their crops, so that researchers can correlate raids with the timing of fruit growth in the forest. At camp and on the weekend, you’ll have opportunities to relax and socialize. On the weekend, you can opt to go shopping at the local markets in the town of Masindi or relax by the pool at the nearby Kinyara Sugar Works. While in the Budongo Forest Reserve, you’ll have the unusual opportunity to watch primates closely in their natural habitat. Tracking chimps with Dr.Fred Babweteera. Earthwatch scientist Dr. Fred Babweteera studies human–primate interactions and works on public policy issues in his native Uganda. The camp consists of several simple buildings in a large clearing in the Budongo Forest. You’ll stay in a single room that contains a bed, bedding, mosquito net, reading desk, and chair. All rooms are connected to solar electricity. There are three pit latrines on the site, which are shared by all. You’ll have access to a warm shower every evening after a long day’s work. Water used at the camp is harvested off the roofs or taken from the Sonso River, so frugal use is necessary. Your evening meals will be prepared by cooks and will include rice, chapatis, potatoes, spaghetti, beans, beef, fish, groundnuts (peanuts), cow peas, assorted fresh vegetables and fruits, and eggs. You will also be served local foods such as cassava, stewed bananas (matooke), and maize bread (ugali or posho). Breakfast will be Western style. As you spend more time in the forest you see more, appreciate it more, and see how and why it is under pressure. The survival of the chimps depends on the forest and it is important to see the big (and complex) picture to understand why their long-term future is threatened. The forest camp is a wonderful place to achieve this understanding. I traveled in April which is the wet season in this part if Uganda. This meant it rained for either a morning or afternoon every two or three days. It also meant that one of the giant fig trees located at the Budongo Conservation Field Station was in fruit and the Sonso habituated chimpanzee group visited the BCFS every day. Other frequent visitors included blue monkeys, black and white colobus, red-tailed monkeys and olive baboons. The activities we were involved in included bird mist netting, tree follows (monitoring all the wildlife that came and went from a particular fruiting tree), and primate observations. I learned so much about how in situ conservation is carried out and the problems facing both the forest and the local people. We had the opportunity to work closely with the staff at the BCFS and for me this really made the trip something special. I also travelled to Murchison Falls National Park on my weeked off and took a riverboat down the Nile and did a game drive which, if you like taking photos of animals like I do was a fantastic addition to the trip. Budongo Conservation Field Station has been building on years of research and experience to refine the activities that have the greatest impact. The team is well organized and sequences the activities so that you get a clear understanding of the community and the forest. It's not just about tracking chimps, it's also collecting data on the health of the forest (tree surveys), recording bird inventories/banding, removing snares that accidentally mangle chimps, and helping the local community find ways to improve their quality of life without poaching in the forest. The briefing accurately describes the field conditions and I thought the food was tasty. Expect to walk 6-8 miles most days on a surprisingly well maintained series of trails with occasional detours through the undergrowth. Cell coverage via Airtel is adequate at base camp so you can check in with home periodically. I will treasure my time in the Budongo Forest with my Earthwatch team and the the amazing staff and researchers there. We participated in real science while helping the local villagers and visiting researchers. It was amazing to get out of my day-to-day job and experience something completely new and different. I loved every minute of it! The chimpanzees’s morning activities slowed until most began taking midday naps, so we stopped to rest as well. I laid my parka on the ground, used my backpack as a pillow and was sound asleep in probably less than a minute. A few minutes later I woke up. Where was I? I looked around and about 20 meters away I saw a brown hairy guy asleep on his back with one knee up. Ah, I must be in the Budongo Forest and the ones over there with hats laughing at me must be my fellow volunteers and our excellent rangers. Imagine living in the forest - the research station is surrounded by the reserve - and being well taken care of with your main responsibilities being to track and record information on chimpanzees who are, mostly, not concerned by your presence. Every morning and evening I went out early to look for birds and monkeys. Hornbills of two species nest in the yard, both African dwarf and African pygmy kingfishers hunt and nest on the “Royal Mile” entrance road. Much of the movement in the trees is caused by the smaller monkeys. I even saw an African grey parrot cruise the yard one morning. I have been on 16 Earthwatch trips. This is one of the best. This project was the most all-encompassing of the expeditions I have been on with Earthwatch. Not only did I get to fulfill a life-long dream of observing chimps in the wild, I witnessed firsthand how global climate change as well as habitat encroachment threatens African wildlife. Our interactions with the neighboring villages clarified how essential working with local communities is for the long-term chimpanzee survival. This opportunity touched my soul, and sparked a desire to educate my students and others about how living in a sustainable way protects the environment and those animals with whom we share the planet. Picture sitting quietly in a primal forest with two other humans, outnumbered by the several chimpanzees sitting just yards away eating peacefully , with neither them nor us in fear of the other. The difference being that the chimpanzees had not the slightest interest in us. That was just one of the many thrilling experiences I had at Budongo Field Research Station. The project offered both animal study and human/animal conflict programs. It enabled me to both understand more about the apes and their issues and to learn a lot about the local culture in spending hours in the field with the Ugandan Field Assistants and chatting about their families and communities. We also enjoyed lively and interesting discussions at the dinner table with the Assistants and with Geoffrey Muhanguzi who coordinates the Earthwatch teams. The Research Station offers basic facilities with private rooms, hot showers in the evening and, perhaps less comfortable but manageable, pit latrines. Some of the hikes are a little on the strenuous side, walking quickly on and off the trails and traversing rivers on logs. This is my third Earthwatch expedition in Africa and my eighth overall and was definitely one of the best. It was hard work tramping through the dense forest following chimps and monkeys. It was also pretty hot but with being able to take a hot shower, getting plenty of rest time and eating satisfying meals the physical demands were not a burden. The variety of activities from tracking primates to evaluating foraging trees to setting insect traps to participating in the snare patrol to assisting the veterinarians to interviewing local villagers to creating sanitation and wildlife posters resulted in a very complete experience. The researchers led by Geoffrey Muhanguzi were very informative, supportive and fun. All the research center staff were terrific and we very much connected with the local community. The team was great (as they always are) and the day-off trips to Murchison Falls and the rhino sanctuary were quite rewarding. I once again felt like I was contributing. Thanks to Geoffrey, Zephyr, Caroline, Andrew, Moses, Nelson, Geresomu, Jacob, Gabriel and others, including the lady who did our laundry everyday. I'm already planning my next expedition. This expedition exceeded my expectations in every way. The staff was exceptional, and you can't beat the location. We were fortunate to have chimps near camp regularly, but all the activities were great. Would definitely go back in a heartbeat! This expedition was fantastic. The research staff was very generous and kind. The staff ensured that the volunteers felt that they were an important part of the project and making a direct contribution. They attended graciously to the needs of the volunteers and did so with a smile. The research camp was very good with comfortable rooms and great food. The toilet and shower facilities were adequate. The volunteer assignments included some trekking but it was not overly strenuous. Sufficient training was provided prior to performing the assignments. Work included collecting information on tree fruiting, observing and recording data on primates such as blue monkeys, redtail monkeys and black and white colobus monkeys, tracking chimps and recording behavior and collecting data on tree rooting to determine energy allocation. The structure between daily work and leisure time was well balanced. The activity options for the days off were interesting and attractive. I choose the opportunity to participate in assisting in vet care of livestock in local villages and interacting directly with the local community. I had a memorable time in doing so. This is a project that all would enjoy with no assignments that would limit participation of seniors or teens making it a great family expedition. I would highly recommend this project. All in all it was a once in a lifetime type experience with the knowledge that it is available to experience again in the future as long as it is offered. My wife and I participated on the Earthwatch project at the Budongo Conservation Field Station (BCFS) in August 2013 - we both had an amazing experience and would highly recommend this project. First and foremost, all of the BCFS and Earthwatch staff were excellent: friendly, helpful, and knowledgeable. They were keen on being gracious and accommodating hosts to us (they even made us pizza one night! ), and this is important because while at the BCFS you are entirely dependent on the staff. The briefing accurately characterized the field conditions and physical requirements, although the title of the project created a bit of confusion as to how much time we would spend devoted to tracking chimps versus the other research tasks (they have since changed the title). Second, the rainforest is spectacular, and you spend your days in the lush forest surrounded by its wildlife - plenty of monkeys, baboons roaming around the camp, and then there's the screaming of the tree hyrax at night (it must be experienced to be appreciated). But of course the chimps are the main attraction, and to spend time with them in the wild is truly amazing. Heading out before daybreak into the rainforest is an experience we'll treasure forever. So, too, was the afternoon spent providing veterinary care to the villagers' livestock. 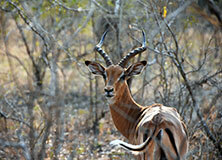 I'd also highly recommend leaving camp for the free weekend to visit Murchison Falls and the Ziwa Rhino Sanctuary. We miss being there and would love to return! Even in a world-class protected area, wildlife needs our support. 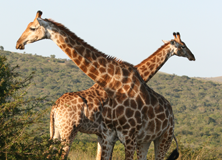 How are giraffes, elephants, and others faring? Held every two years - next in 2020.